Breaking News! 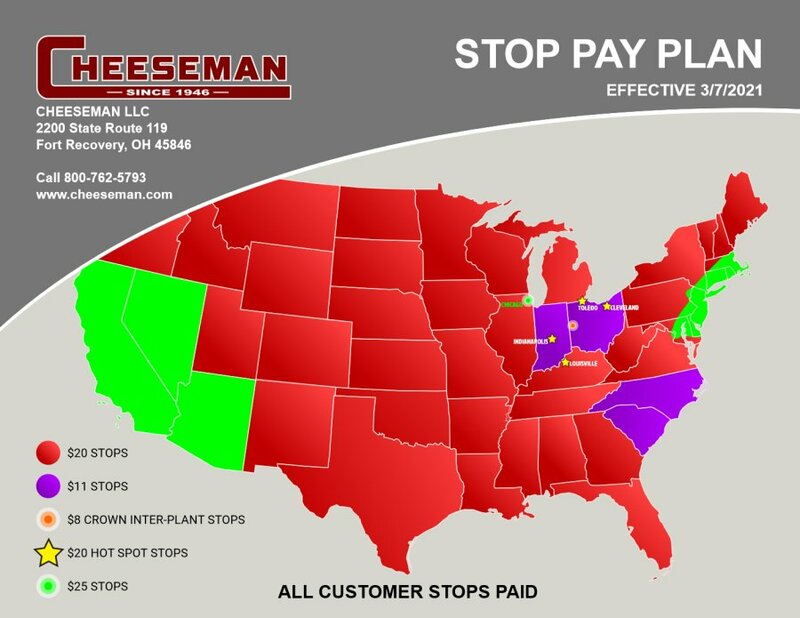 Cheeseman raises Driver Pay for the second time in 2018. Drivers can now earn up to $0.58 per mile depending on the region they run! 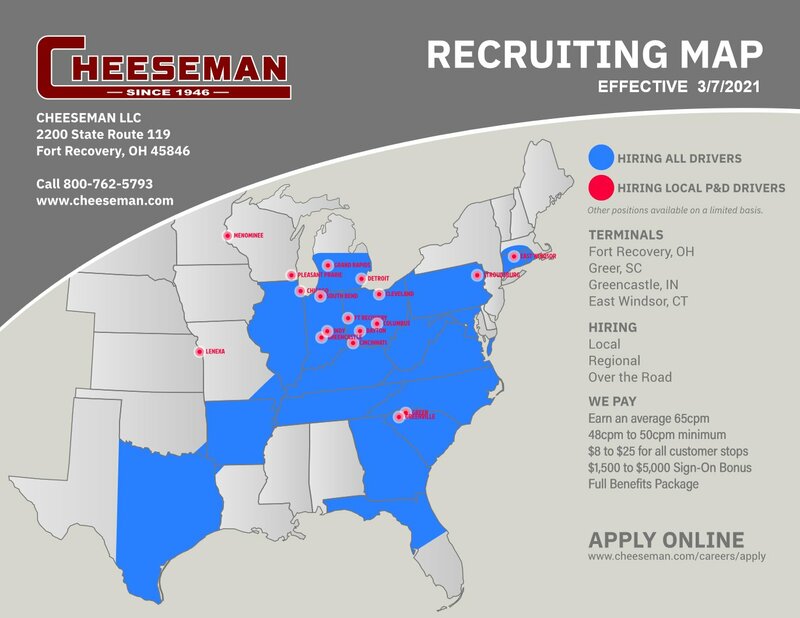 Contact a recruiter today at 800-762-5793 or view driving opportunities. We offer very competitive mileage, stop, bonus, vacation, and time-off compensation. We're hiring drivers, freight handlers, and mechanics in multiple locations. 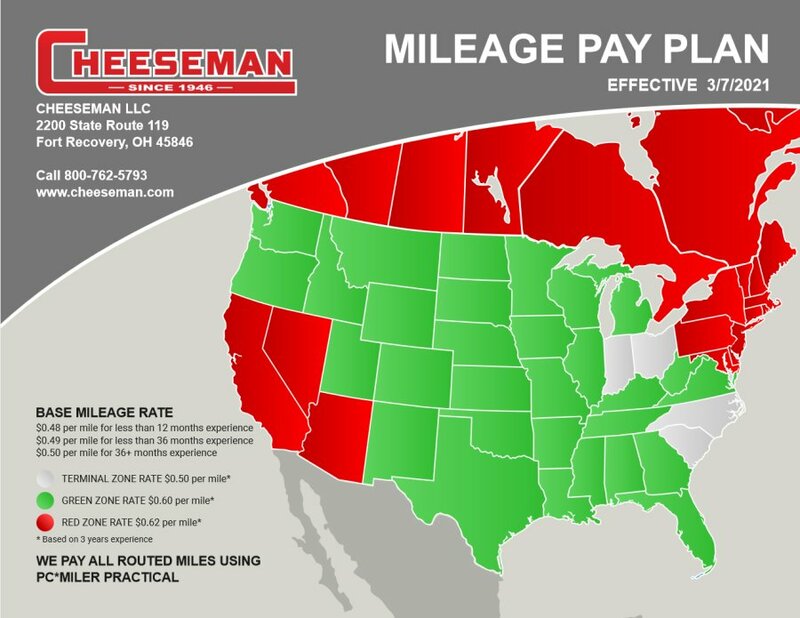 We offer a competitive mileage pay plan with premium mileage rates. Our stop pay plan pays $11 to $25 for all customer stops. Take a look at our recruiting map to find a location near you. 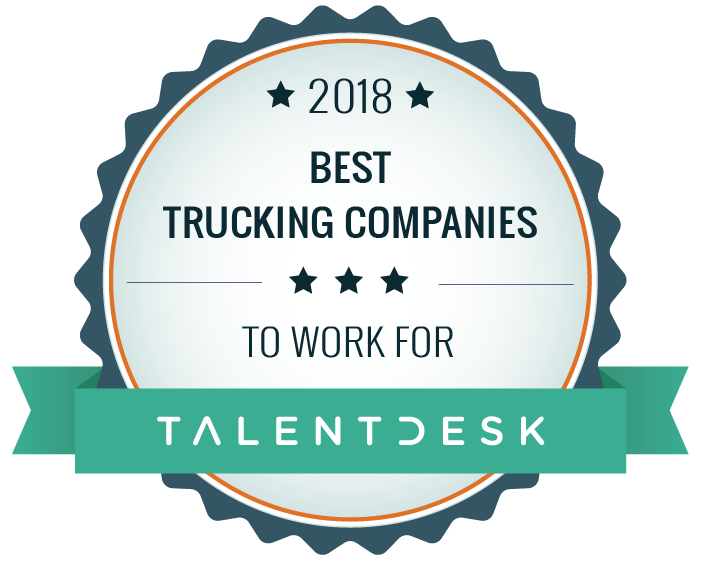 most in the industry by paying practical mileage zip-to-zip, stop pay for all customer deliveries & pick-ups from $11 to $25, premium pay for handling and securing, premium pay for all haz mat placarded shipments, weekly home time depending on load assignment, and driver support including turn-by-turn truck routed in-cab navigation, CSA compliance with eDriver Logs, easy access to time off, vacation, and holiday pay. with our primary lanes running between the terminal facilities in OH, IN, SC & CT. Our fleet consists of 300 tractors and 940 trailers where we use them for truckload, less-than-truckload, multi-stop, expedited and load-to-ride service. Our primary freight base includes material handling equipment (lift trucks, hand jacks, tow motors, etc), manufacturing goods, consumer goods, precision bearings and miscellaneous products.